Monocytes are involved in adverse left ventricular (LV) remodelling following myocardial infarction (MI). To provide therapeutic opportunities we aimed to identify gene transcripts in monocytes that relate to post-MI healing and evaluated intervention with the observed gene activity in a rat MI model. In 51 MI patients treated by primary percutaneous coronary intervention (PCI), the change in LV end-diastolic volume index (EDVi) from baseline to 4-month follow-up was assessed using cardiovascular magnetic resonance imaging (CMR). Circulating monocytes were collected at day 5 (Arterioscler Thromb Vasc Biol 35:1066-1070, 2015; Cell Stem Cell 16:477-487, 2015; Curr Med Chem 13:1877-1893, 2006) after primary PCI for transcriptome analysis. Transcriptional profiling and pathway analysis revealed that patients with a decreased LV EDVi showed an induction of type I interferon (IFN) signalling (type I IFN pathway: P value < 0.001; false discovery rate < 0.001). We subsequently administered 15,000 Units of IFN-α subcutaneously in a rat MI model for three consecutive days following MI. Cardiac function was measured using echocardiography and infarct size/cardiac inflammation using (immuno)-histochemical analysis. We found that IFN-α application deteriorated ventricular dilatation and increased infarct size at day 28 post-MI. 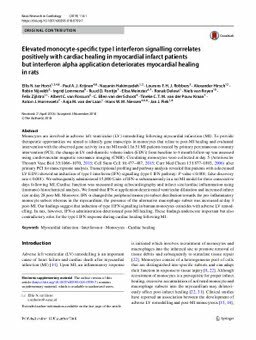 Moreover, IFN-α changed the peripheral monocyte subset distribution towards the pro-inflammatory monocyte subset whereas in the myocardium, the presence of the alternative macrophage subset was increased at day 3 post-MI. Our findings suggest that induction of type I IFN signalling in human monocytes coincides with adverse LV remodelling. In rats, however, IFN-α administration deteriorated post-MI healing. These findings underscore important but also contradictory roles for the type I IFN response during cardiac healing following MI.